Everything you ever wanted to know about billboards. How much does it cost to advertise on a billboard? Just like most media, billboards are priced on their audience delivery. The cost per 4-week period will vary based on the traffic – the number of people that see the ad, the size of the panel, what type of road it’s on, the psychographics of the viewers and more. How does billboard advertising compare to advertising on other media? Out of Home advertising has the best delivery and lowest Cost per Thousand of any traditional media. For a fraction of the cost, an Out of Home program will deliver impression levels comparable to much more expensive TV campaigns. How do I begin to put together a billboard ad? A Link Media account executive will have a meeting with you to identify your business goals, target customers and expectations of the program. They will have our in-house designers create a couple of draft ads for you to review. Upon approval, we will order the vinyl and have it installed. We offer full service from beginning to end. We may need your help with your logo and other art elements. How long does it take to get an ad up? One of the advantages of digital billboards is that your ad can be posted within a few hours of final approved art. If the campaign involves vinyl billboards, your ad can generally be posted within two weeks of receiving your art approval and payment. How do I know the advertising will work? Some other variables about your business that affect results include: a) Are consumers familiar with your company and products? b) What is the market perception of your business? c) How many nearby competitors do you have? d) Is your location easily accessible with plenty of parking? e) Do you and your staff provide an enjoyable shopping experience? f) Do you have enough inventory and a competitive price of what you are advertising? Variables about the billboard that affect results include: a) Is the ad easy to read – limited text, simple fonts, color contrast? b) Does the ad connect emotionally – use of an image or concept? c) Does the ad portray benefits to the consumer or is it a menu? d) Is there a call to action motivating the consumer to respond? How do I know this is a good billboard ad? On a color printer, print a (horizontal landscape) version of your ad on a standard 8/12 by 11 piece of paper. Tape it on a wall or have someone hold it 8 feet away from you. Look up at the ad for a count of 6 to 8. Then tell yourself what you saw and what you remember. Did you clearly see the business name and what you are promoting? Did you feel a connection to the message – a sense of need, urgency, solution, happiness? Did you understand how you could take advantage of the ad message? How long will it take before I begin seeing results? Remember that the advertising needs to build awareness, build trust in the provider, modify consumer behavior and get them to spend. The longer the decision making process, the longer it takes to see results. Constantly look for ways to ease the sales cycle for the customer: selection, price, knowledgeable staff and financing. 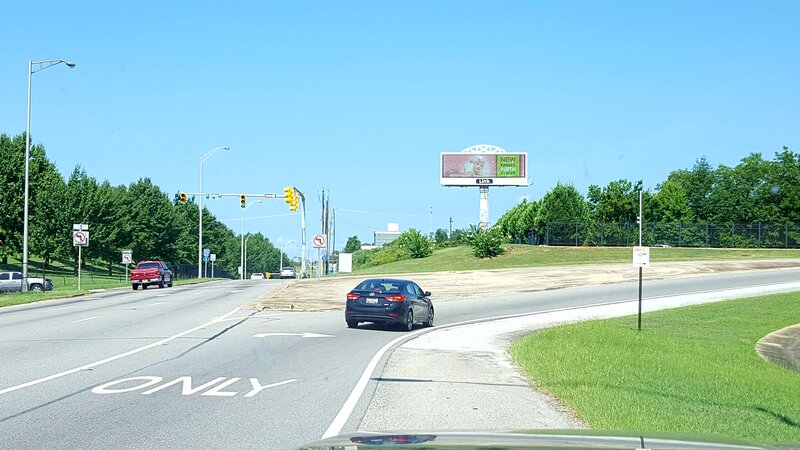 What is the difference between Digital Billboards and traditional Static Billboards. The technology for Digital Displays has opened the door for billboards to be even more responsive to sponsor needs than traditional TV or Radio. An advertiser can now post more than one piece of copy, at a time – rotating different offers or promotions. You can daypart your messages – a morning ad can be different than an afternoon ad – or a Monday message can be different than Friday’s. The advertiser can do a countdown, prompting consumer response – Sale Begins This Weekend – or Only 2 Day Remaining. The messages can include real time content such as temperature, time or weather forecast triggers. Social media can be integrated, such as Facebook posts or Instagram photos. How do ads work on Digital Billboards? The process for creating digital billboard artwork is generally the same as for vinyl billboards. Our in-house design team is aware of special nuances that are part of digital displays , so it’s best to rely on their expertise. Question not covered here? Let us know.